It’s hard to know which features will win you over first when it comes to Sal Kimber. Her warmth and charisma makes you feel like you’ve discovered an old friend. Her distinctively Australian songs – as showcased on her debut album : Sounds Like Thunder – capture the power of the landscape, while telling stories of city life with tender detail and humour. Hailing from the mountain valleys of Victoria’s North East, Sal Kimber grew up with a father who was a songwriter and sisters who were musicians. For Sal, writing songs became a family past-time and naturally became her passion. After first playing to audiences in England at local pubs, Sal Kimber returned home to Australia and chose Melbourne as her new base. Her song writing on Sounds Like Thunder is inspired by her new city life, and the solace that can be found in returning to the country during times of feeling consumed by the big smoke. Such inspiration is captured in the title track – Sounds Like Thunder – that won first prize in this year’s songwriter’s award at the Darebin Music Feast. Sal Kimber’s lyrical and musical compositions have been recognised and rewarded over the last few years by receiving: The Emerging Artist’s Award at Port Fairy Folk Festival, The Wangaratta Jazz Festival’s Acoustic Jazz Award and was selected to partake in the Woodford Emerging Artist Program. One can tell by the titles of these respective awards that Sal Kimber is an artist of many genres. Folk, jazz, ragtime, and country – Sounds Like Thunder - is all of this rolled into one debut album and is bound to appeal to those who appreciate music outside these genres thanks to Sal Kimber’s catchy songwriting. Sounds Like Thunder is a mixture of live recordings that breathe of ambience,and full band arrangements. Sal Kimber’s band on Sounds Like Thunder -‘The Good Ole Boys’ (pictured left) - perform double and electric bass, drums, banjo, accordion, distinct telecaster, dobro and xylophone. 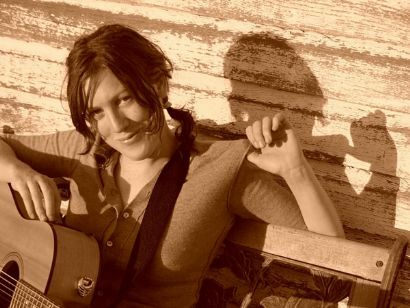 Sal Kimber provides old time inspired banjo as well as vibrant guitar playing underneath her charismatic voice.Equally engaging whether performing as a solo artist or in front of a band, Sal Kimber will be travelling Sounds Like Thunder far and wide around Australia in 2008. Regional Australia will not be forgotten, after all, this is where Sal’s heart is.